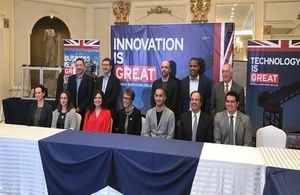 Representatives from ten British companies of the infrastructure and construction sectors will arrive in Guatemala on 27 February to connect with their Guatemalan counterparts and to explore business opportunities. The delegation will hold meetings with government, municipal and private sector representatives in a 2-day business engagement with a focus on multiple areas, which they represent and that are critical to improving Guatemala’s competitiveness and sustainable development. The companies represented are AKT II (civil engineering and design), Biwater (water treatment and solutions), Buro Happold (city mapping), ERM (business sustainability), Foster and Partners (architecture), Gillespies (urban design), JCB (construction equipment), Solarcentury (solar energy), Steer (transport solutions), and Tyréns (community development). The mission aims to strengthen the development of sustainable cities, promote environmentally friendly projects and demonstrate an understanding of today citizen’s most pressing needs. It also seeks to create business opportunities for Guatemala’s small and medium businesses that are interested in collaborating in investment opportunities. As part of this visit, the delegation is also travelling to Costa Rica and Panama. Whilst in Guatemala, the delegation wants to explore opportunities presented by the country’s plans to improve its critical infrastructure, including updated legislation, the use of Private Public Partnerships and the desire to continue building the UK-Guatemala economic relationship. In light of the upcoming UK exit from the EU (Brexit) on 29 March, Britain wants to reaffirm the importance of Central America as a trade and business partner. This visit is a wonderful opportunity to showcase some of the leading UK infrastructure and construction companies and provide them with a platform to develop key partnerships in Guatemala. The UK is a global leader in these sectors, and such delegations focus on driving international trade and investment in emerging fields to secure a prosperous future for the UK and its partners in the global economy.